If an order has been placed, it must be set to Void to be deleted. If an order has not yet been placed, it is an Open order and can be deleted at any time. If you are using Invoicing and you have Invoices attached to the Order, you will need to delete those first. 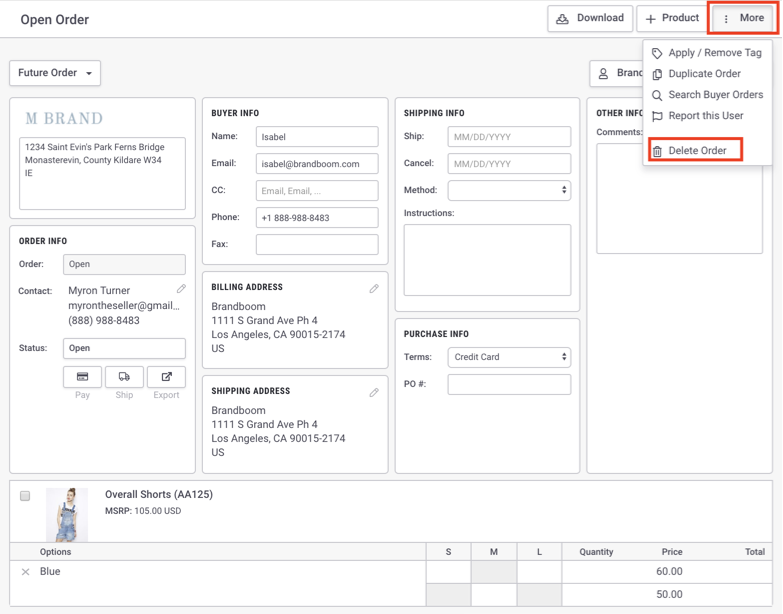 See Edit an Order after it has been Invoiced for more information. Inside the order, click "More" in the upper right corner and select "Delete Order." If the "Delete" option does not appear, double check that the Order Status is set to either Open or Void. Select multiple Open or Void orders from the Orders page and select "Delete" from the status dropdown in the toolbar.